A good villain is the heart of a game. When the enemy is a two-dimensional cardboard cutout, you don't feel a sense of accomplishment in victory. The story becomes a melodrama with a mustache-twirling Snidely Whiplash at the end. Really satisfying villains justify their actions, have complex motivations, and cause serious harm to the player. The great villains of the Baldur's Gate game series linger in the minds of players over a decade later because they are complex but can be understood, even sympathized with. In today's Behind the Scenes blog, Amber Scott returns with the backstory of the villain in our office D&D game, Orc Hordes of the King's Forest. Every Friday we play the latest edition of Dungeons & Dragons here in the office, so that we can learn the rules and understand better how games work (also because it's fun). The PCs have been tracking an orc named Urmgech across Cormyr, as the orc seems to be behind a plague that's spreading through the land. You can read a recap of the game on our forums. After the first few sessions of play, with the heroes fighting orc bandits and struggling to reach the city of Arabel, I realized I needed to lock down the villain and his motivations. The orcs needed some compelling reason for their banditry. Why were they leaving the King's Forest to attack caravans, towns, even cities? I started brainstorming reasons for the orcs' behaviour. Were they being driven by a strong figure—perhaps a dragon or demon? That seemed a little too much like the plot of Icewind Dale: Enhanced Edition. Was a greedy new leader motivating them? Too boring. Perhaps a religious leader was behind the banditry. I started reading up on orc deities, and Yurtrus caught my eye. What if banditry was their secondary goal and the orcs were really spreading a sickness to their victims? An hour and much frantic scribbling later, I had the backstory for the campaign's villain, Urmgech. Spoilers ahead for anyone playing in the game! Crouched in the reaches of the Stormhorns, the Sharpstaff orc tribe made their home. From their base in an abandoned dwarf mine, the orcs lived out their lives hunting, preying on lone travelers, fighting among themselves, eating, drinking, and revelling. The leader of the tribe, the warrior Slarn, ruled with customary brutality alongside his mate Chonnal. The other orcs respected Slarn for his strength and combat might and willingly obeyed his commands. It was a good life for the orcs—save for the tribe's priest, Urmgech. Urmgech would have led a short and unfulfilled life if Yurtrus himself had not intervened. In early spring, the tribe fell sick. The fever, vomiting, and weakness was traced to rancid meat on which the tribe had feasted. Slarn accused Urmgech of failing in his duties, but Urmgech protested that he had checked the meat repeatedly and it had been fine. It had spoiled all within a night. Then some of the orcs started recovering. Not only did they recover, but they were stronger and more ferocious than before. They showed exceptional strength and grew long white nails—symbolic of the white-handed Yurtrus. Exhilaration seized Urmgech. Sure, some of the orcs had died, but the ones that hadn't were obviously Yurtrus's chosen. Urmgech took it as a sign that his god was helping him. That night, around the bonfire, he approached the tribe. After making a long speech about Yurtrus's blessings and how the tribe was destined for greatness, he attacked and slew Slarn. The other orcs watched, dumbfounded, as Yurtrus claimed leadership of the tribe. With much of the tribe still ill, and those who had healed reveling in their new strength, the tribe agreed. Chonnal volunteered to be Urmgech's new mate and the two took over the tribe. Soon a profound change swept through the tribe. The strong orcs were made lieutenants and sent away to find gold for Urmgech. Banditry, theft, extortion—Urmgech didn't care how the gold was obtained. He claimed Yurtrus had sent him a vision and he required lots of treasure to carry out the plan. 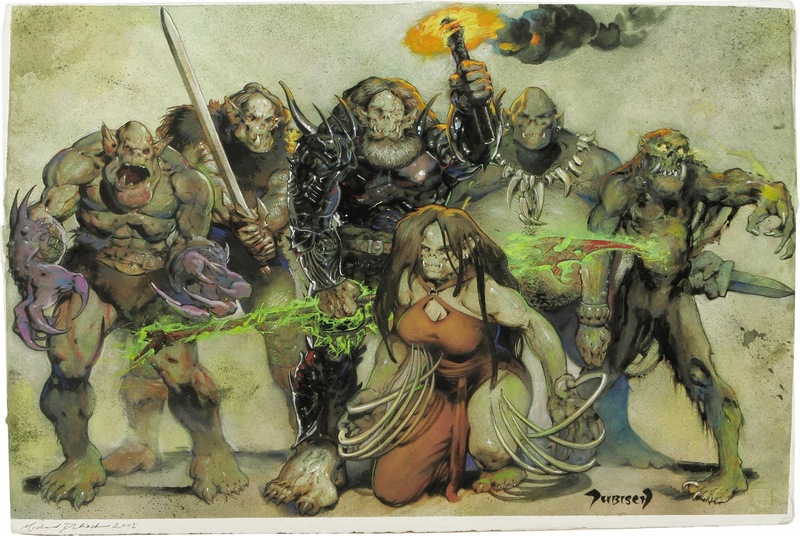 On their missions, the orcs were also to spread their disease as much as possible. Some orcs recovered with exceptional strength but scrambled minds. They venerated Yurtrus by sewing their mouths shut (as Yurtrus is a silent god) and inserting feeding-tubs into their stomachs through their guts. These pitiful but dangerous servants were sent with the lieutenants out into the world. Soon the money started pouring in. Many of the orcs were killed on their missions but Urmgech didn't seem to mind. A new age was coming and he would rule in it. Other races exposed to the disease died after a prolonged illness—only the orcs survived and strengthened. Wasn't that proof that Yurtrus had blessed the tribe? No more would Urmgech be the Maggot. Now he would be chieftain over Cormyr. When Urmgech had a large fortune amassed, he loaded up all the gold into a wagon and set out south through the peaks of the Stormhorns, leaving Chonnal in charge of the few orcs that remained in the mine. His destination: a large cave carved into a mountainside. There laired Rillelbellax, a mighty red dragon. Urmgech approached the dragon's lair with caution. He stood at the entrance to the cavern and called down praises on Rillelbellax's head. He heaped adoration on the dragon and stated his attention to pay tribute to the magnificent beast. Eventually a plume of smoke wafted out of the cave and Urmgech cautiously entered. Rillelbellax deigned to poke his massive head into the cavern and demand to know what Urmgech wanted. Nothing, the orc swore, but to pay homage to the greatness of the dragon. The orc gestured to the cart he had brought: gold, silver, jewels, and art objects piled in a glittering heap. To the side of the treasure horde were several slain boars that Urmgech had hunted on the way. The greedy red accepted the tribute and dragged the carts into his lair while Urmgech hastily retreated. Now, days have passed and Urmgech can hear Rillelbellax's groans of pain from within the mountain. The slain boars, carefully infected with Yurtrus's disease, bring an end to the great red. When the dragon dies, Urmgech will summon his lieutenants and drag the rotting, infested corpse down to the Dragonmere. There the red dragon's disease-riddled form will sink beneath the largest freshwater source in the country, spreading the plague to such a degree that it will never be stopped. Then, when the people of Cormyr lay dead and dying, Urmgech will take his place as the kingdom's new ruler, in Yurtrus's name.